The biobased economy concept is broadly defined here as a shift towards more sustainable production practices that utilize biological processes and/or biotechnology throughout the product supply chains. The prefix “biobased” indicates that organisms are the foundation of what is being produced. Ideally, the biobased economy should as far as possible replace production practices that require the use of fossil and mineral resources, with naturally occurring processes that do not deplete natural capital. Biomass from organisms is used as a feedstock to produce various valuable products. The biorefinery is central to the biobased economy allowing for the optimal utilization of the different chemical components extracted and processed from biomass. The term “‘biobased economy” is also used to refer to an entire economy of multiple supply chains at national and or even regional scale. The word “‘economy” in the term empathizes the synergy and interaction between different businesses all using biobased technologies throughout their supply chains. Biomass is the feedstock from which biobased products are produced. There are various forms of biomass including crops, algae, bacteria, yeast, fungi, and organic waste streams. Organic waste can include leaves, tree, and shrub clippings from road and green area maintenance, flower clippings from floriculture, timber waste from wood processing, municipal wastewater sludge, and animal manure from livestock. Microorganisms such as algae, bacteria, and yeast can be grown on unconventional feedstock such as saltwater. The starting point for biomass production is photosynthesis. Photosynthesis uses sunlight to convert carbon dioxide (CO2) and water into oxygen, and chemical energy. The chemical energy is used for the growth of the plant or microorganism. The accumulated mass of the plant is referred to as biomass. Biomass can be used to produce fuels, raw materials, and finished products. In principle, using biomass as an alternative to fossil fuels, fossil raw materials, and minerals presents a clear advantage of displacing the extraction and consumption of these limited resources. Fossil fuels are derived from crude oil, coal, and lignite, which were formed from biomass being trapped in the earth’s crust under pressure for hundreds of millions of years. Crude oil, for example, is currently extracted from the subsurface and processed into a range of products including fuels, such as petroleum and diesel, chemicals and plastics. The extraction process itself and the processing of the fossil fuels requires energy and material inputs. At the same time, the production and use of fossil fuels release unwanted emissions, such as Green House Gases (GHGs), into the environment. Atmospheric CO2 is one of the GHGs emitted during the combustion of petroleum or diesel. Essentially, the use of fossil fuels results in the large carbon stocks deep beneath the earth’s surface being extracted and converted into energy and atmospheric CO2, among other emissions. GHG emissions increase radiative forcing or in other words trap incoming heat from the sun. In turn, the increase in CO2 and other emissions contribute towards global warming and ultimately climate change. It would require hundreds of millions of years for carbon released into the atmosphere by the use of fossil fuels, to be sequestered by plants and returned to the subsurface, without human intervention. Fossil resources are therefore considered to be nonrenewable and follow a cycle over a long time horizon of hundreds of millions of years (Bertine and Goldberg 1971; McKendry 2002). The benefits of the transition towards a biobased economy and its contribution towards achieving the sustainable development goals have been emphasized by the EU commission (EC 2011). The biobased economy can contribute to lower carbon emissions and helps to mitigate the effects of climate change (Sustainable Development Goal 13: Climate action). Moreover, the biobased economy provides the opportunity for creating highly skilled jobs and new business models in the agricultural, forestry, and agri-business sectors. Ultimately, this will stimualte economic growth and result in decent employment (Sustainable Development Goal 8: Decent Work and Economic Growth). Unlike fossil fuels, biofuels derived from biomass grown recently on the earth surface do not deplete the stock of fossil resources in the subsurface and do not emit the trapped stock of carbon as atmospheric CO2. Instead, biomass production sequesters atmospheric CO2 and temporarily stores the carbon element. Biomass is used to produce biofuels and biomaterials and the stored carbon is converted back to atmospheric CO2 when the biofuel is combusted or when the biomaterials degrade. In short, biomass-derived products replace fossil fuels and fossil resources allowing the stock of carbon to remain in the subsurface. In theory, by having a short cycle of carbon between plants, biofuels, and the atmosphere, there is no net increase in atmospheric CO2 and the energy derived from it for human purposes is renewable (Sustainable Development Goal 7: Affordable and Clean Energy). Converting different forms of biomass into the desired products requires some processing steps and the use of land. In some cases, biomass processing may require inputs beyond what can be provided by organisms. It is of course possible to imagine biobased products that have unwanted consequences for the environment and that in some cases could be less desirable in terms environmental damage than conventional fossil-based products. A fair comparison of biobased products to fossil-based products that reflects the potential trade-offs between making this switch, requires considering all the necessary resources inputs and emissions throughout the life of the products compared. The potential trade-offs between replacing conventional products with biobased products are discussed throughout the chapter. The ‘Concepts’ section first provides an explanation of the different sequential steps in deriving biobased products, namely, biomass production and biomass conversion. The ‘Concepts’ section starts with an overview of biobased product supply chains followed by an explanation of the components that make up such chains. 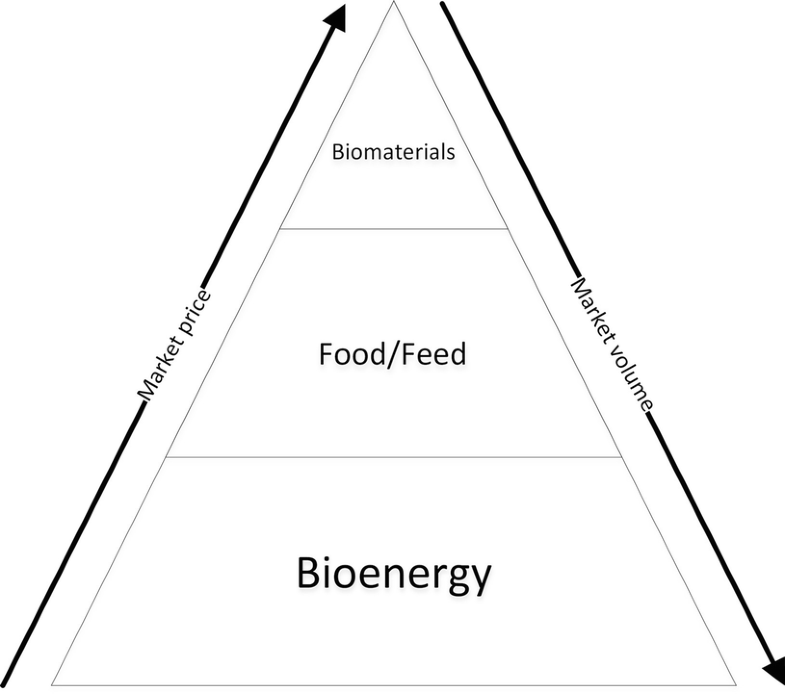 The concepts come together in the theoretical underpinning of the biobased economy, namely, the Biomass Value Pyramid. The Biomass Value Pyramid is a general principle reflecting the value and quantity of different biobased value streams that can be produced in a biorefinery. An explanation of biorefineries gives the reader a sense of how the concepts and principles are applied in practice and what needs to be considered. The ‘Concepts’ section concludes with a discussion on closing material loops in the biobased economy. The ‘Future Developments’ section concludes the chapter by discussing the potential advantages and challenges of the biobased economy in the future. Organisms, such as plants on the earth’s surface, capture and store energy from sunlight by accumulating biomass. Higher-order organisms such as animals indirectly consume the energy from sunlight and nutrients from the soil, when they consume biomass in the form of plants or other organisms that directly or indirectly consumed plants. Biomass from plants is also the starting point for most biobased products (Langeveld et al. 2012). Efficiently harnessing energy from crop biomass and maximizing the yield of raw materials from crop biomass requires an understanding of which inputs deliver the greatest yield of the desired end-product. Comparing the environmental performance of biobased products to products derived from fossil resources requires both accounting for the yield per input and the upstream energy and material required per input (Muñoz et al. 2014). A supply chain consists of all parties involved, directly or indirectly, in the flow and transformation of goods and services from the origin of the product through to the customer. Supply Chain Management is concerned with the management and control of the flows of material, information, and finances in supply chains to provide the desired levels of service to eventual customers. In the biobased economy, biomass is produced, harvested, collected, and transported before it is converted into the desired products. How the quantities of material are stored and transported and where the different actors should be located is the domain of Supply Chain Management. Biomass supply chains can be divided into three phases, each of which includes multiple processing steps. The three phases include upstream, midstream, and downstream (De Meyer et al. 2014). Generally speaking, the upstream phase is where biomass is produced, such as a farm; midstream is where the biomass is converted into products such as bioenergy, biofuel, biobased chemicals, or bioplastics and finally downstream is where the product is eventually consumed. Figure 1 is a flow diagram adapted from De Meyer et al. (2014) showing the three phases in a biobased product supply chain. Within the three phases are processes beginning with biomass production sequentially followed by harvesting and then pre-treatment and so on. There are also flows that are not sequential. This might, for example, refer to left over or residual materials that can be reused in one of the previous processes or further downstream. According to De Meyer et al. (2014), the key barrier for the bioenergy sector, which is also more generally relevant to the biobased economy, are the costs of biomass supply to the conversion facilities. Biobased supply chains have three additional considerations, which are unique to biomass. Firstly, biomass production (the first process in the upstream phase) is largely influenced by seasonality and weather conditions. If farms producing biomass are effected by extreme drought or flooding in a given year, this has consequences for every other process upstream and eventually the final delivery to the customer. Secondly, biomass is perishable and storing raw biomass for prolonged periods has the risk of unwanted natural biodegradation and fermentation occurring (Rentizelas et al. 2009; Gold and Seuring 2011). Thirdly, biomass products are also commodities for which prices can fluctuate. If the price of a given type of biomass in a given year is higher due to more competition from other industries, this will affect the entire supply chain. In fact, in 2006 and 2007, the increased investments in and subsidization of biofuel by the EU and US governments increased demand for commodity crops, such as corn, globally. In this case, the increased competition for biomass to produce biofuels resulted in food price increases (Langeveld et al. 2012). Plants, algae, some bacteria, yeast, and fungi use chlorophyll to convert sunlight, water, and CO2 into chemical energy and oxygen. Plants use chemical energy and nutrients from the soil for maintenance and growing proteins, fats, and fibers. What remains of the chemical energy used for maintenance and growth is stored as carbohydrates. Certain crop species of plants are more efficient at this process than others; however, the availability of necessary water and nutrients, the climate conditions, and the prevalence of pests also largely influence crop yields. The availability of water is a key limiting factor in dry climates where crops are rain fed. Some crops are better suited to dryer conditions. Crop species can be divided into three different categories according to the way carbon is fixed and photorespiration occurs, namely, C3, C4, and CAM. Carbon fixation and photorespiration are necessary for plant growth but photorespiration in particular is also a wasteful process. The “C” in the terms C3 and C4 refers to the carbon element in the molecules produced in the first step of the photosynthetic pathway of the plant species. CAM refers to Crassulacean Acid Metabolism. C3 plants include cotton and wheat, C4 plants include maize and sugar cane, and CAM plants include cacti species. Generally, C3 species are suited to all climates but are most efficient at carbon fixation in cooler wet climates, C4 are generally suited to warmer climates, and CAM species are best suited to very hot and dry climates. C4 and CAM plants are generally more efficient at accumulating energy in the form of carbohydrates than C3 plants. In other words, the yield over a fixed period for a given area (e.g., 1 ha) of C4 crop is greater that a C3 crop. This is because C4 and CAM plants have mechanisms for minimizing the energy they spend on photorespiration that C3 plants do not have. The hotter and dryer the climate, the more C3 plants will consume energy for photorespiration, that would have otherwise been stored as carbohydrates. Appropriately choosing the most suitable crop for warm and dry regions increases the chance of a maximum yield per area (Zhu et al. 2008). Climate is a factor that cannot be controlled and is region specific. Nutrients on the other hand can be controlled. Nutrients can be a limiting factor for the growth of the plant. Nutrients can be classified in two categories: macronutrients and micronutrients. Plants require a larger proportion of macronutrients than micronutrients. Micronutrients are only required in small quantities. Macronutrients include calcium, magnesium, nitrogen, phosphorus, potassium, and sulfur. Micronutrients include copper, iron, manganese, and zinc. A study by Hoskinson et al. (2007) compared the nutrient concentrations contained in corn harvest residues (corn stover) and calculated the equivalent micro- and macronutrient removal by the corn stover. The macronutrients removed from the soil by the corn stover were in the order of approximately 42 kilograms per hectare (kg/ha), 4 kg/ha, and 34 kg/h of nitrogen, phosphorus, and potassium, respectively. The micronutrients removed by the corn stover were in the order of approximately 6 gram per hectare (g/ha), 258 g/ha, and 46 g/ha of copper, iron, and zinc, respectively. Maximizing crop production requires that nitrogen, phosphorus, and potassium are always available in the soil. Synthetic fertilizers consist of the combination of the three macronutrients and can be applied to the soil to make sure the macronutrients are always available. Manufacturing synthetic fertilizers, however, requires energy inputs. The industrial production of nitrogen fertilizer requires taking nitrogen from the atmosphere and fixing it using the Haber process, which is very energy intensive. Phosphorus is manufactured from phosphate rock, which is mined from beneath the earth surface. Potassium is also mined and is manufactured from potash deposits. Plants are also vulnerable to being consumed by other organisms. Pesticides to protect the crops from molds, insects and small animals that would otherwise damage the crop are produced from petrochemicals which originate from fossil resources below the earth surface. The transport of fertilizer and pesticide throughout their supply chains is an indirect input required for crop biomass. Plowing the soil, harvesting the eventual crop, and storing it also requires energy in the form of fuel as well as materials that the harvesting, transport, and storage assets are constructed from. In an ideal biobased economy, the indirect energy inputs and materials input for transport, fertilizer, and pesticide production would come from biobased sources and not fossil fuels. The energy, fossil materials, and mineral inputs that are not biobased in origin should also be accounted for in a holistic view of the efficiency and performance of biomass crop production. Similarly, when comparing fossil-based products to biobased products, the upstream energy and material inputs for the fossil products should also be accounted for. The same is true for GHG emissions emitted throughout the life cycles of products being compared. Switching from an economy largely dependent on fossil resources to a biobased economy that minimizes the dependence on fossil fuels might require more available land for biomass production. In a broad sense, this switch away from extracting the stock of fossil resources in the subsurface to utilizing surface space for biomass production will result in a certain degree of land-use change (Langeveld et al. 2012). Assessing the consequences of such land use changes with respect to, e.g., GHG emissions and biodiversity loss are important considerations and require advanced quantitative analysis and decision support tools. The increase in global agricultural production since the Green Revolution of the 1950s and 1960s is predominantly due to production system efficiency and the development of synthetic fertilizers, selective breeding, and pesticides. Since the Green Revolution, global cereal production has increased 200% with only a 30% increase in area for cultivating cereal crop (Pingali 2012; Wik et al. 2008). What is still not clear is the extent to which existing cropland can provide feedstock to replace fossil fuels and how much additional cropland needs to be set aside for the Biobased economy. Biomass needs to be harvested before it is collected, transported, stored, and eventually converted to products. This subsection explains the conversion phase with reference to three particular biobased products, namely, biogas, bioethanol, and polylactic acid (PLA). Biogas is a renewable energy sources which can be produced from various forms of biomass feedstock including crops, manure, or other organic waste such as food waste or flower clippings. The feedstock is put into a digester tank or reactor without sunlight or oxygen where it is fermented. Anaerobic bacteria degrade the feedstock releasing methane and CO2 in the process. The remaining residue that is not converted to methane and CO2 is referred to as digestate and is rich in minerals such a phosphate that can be used as fertilizer. Certain configurations of different kinds crop and organic waste stream deliver greater yields. Depending on the process, the reactor can also be heated to increase the yield. The biogas can then be combusted in a combined heat and power plant to generate heat and electricity. Bioethanol is a fuel typically produced from high sugar/starch biomass crops such as sugarcane and corn. Molasses, which is a side product from converting sugarcane and sugar beet into sugar, can also be used as a feedstock. Bioethanol is produced in three stages, namely, pretreatment, conversion of sugars to ethanol, and finally purification. In the pretreatment phase, the sugars contained in the biomass are made available by milling and grinding the feedstock. Enzymes can be added to the mixture to further break down the feedstock. The second phase involves putting the preprocessed feedstock into a fermentation tank and allowing yeasts to convert the sugars in the feedstock into ethanol. Finally, the converted feedstock is purified via distillation. Distillation involves heating up the converted feedstock so that the ethanol can be separated from the water and yeasts. Bioethanol can then be used in combustion engines in vehicles as an alternative to petrochemical fuels. PLA is a biodegradable plastic produced from high sugar/starch biomass crops and typically corn. Other crop biomass may also be suitable such as rice, sugarcane, sugarbeet, wheat, and sweat potato. The feedstock is processed through a series of reactors to first convert the sugars into lactic acid and then to convert the lactic acid into PLA. The first phase of producing lactic acid requires putting the feedstock into a fermentation tank with bacteria and ammonium, which can be derived from biobased sources. The bacteria convert the feedstock into CO2, ethanol, and ammonium lactate. The ammonium lactate then needs to be separated into lactic acid and ammonia. This can be achieved via a process called electrodialysis, where the ammonium lactate is passed through an electrically charged membrane. The second phase of converting lactic acid into PLA can be achieved via one of either two processes, namely, direct polymerization or ring-opening polymerization (Vink et al. 2003). The three examples above require varying degrees of processing and inputs including energy, solvents, materials, and machinery. The costs of producing each of the examples therefore also vary. The Biobased Value Pyramid discussed below suggested a value hierarchy between different biobased products. The conversion of biomass to energy and materials requires inputs. The more refined the eventual product, the more inputs are required and the greater the financial cost per unit (ton or cubic meter, etc.) of eventual product. Not only does it cost more to further process biomass into higher value products but it also requires more energy and material inputs. At the same time, using biomass for producing heat and electricity destroys the chemical chains in biomass, that could have otherwise been converted into more valuable materials. A fundamental principle of the Biobased economy is the biobased pyramid (Fig. 2). There are various interpretations of the Biobased Value Pyramid but the interpretation adopted here suggests that the most valuable biobased products should be prioritized according to a cascade. This means, biomaterials and pharmaceuticals from biomass should be prioritized over food and feed production, which in turn should be prioritized over energy production. The assumption is that residual biomass stock and organic waste, from biomaterial and pharmaceutical products, can then be used for food ingredients and animal feed. In turn, what cannot be utilized for food ingredients and animal feed can then be fermented and converted into biofuels and biogas. Another concept which can explain prioritizing the production of more refined products over energy production is Exergy. Exergy preservation seeks to preserve the embedded complexity and embedded effort of the original product. In the case of biobased products, the use of biomass for biofuel and biogas which is eventually combusted does not preserve the embedded complexity of biomass as well as products which convert the chemical chains in biomass to more complex chemical chains. Exergy is also called Availability or Work Potential and is the maximum useful work that can be obtained from a system at a given state in a given environment. In other words, the most work you can get out of a system. Another way of defining exergy is the degree of disequilibrium between a system and its surroundings, or the capacity to cause change by exchange with the environment. A system can only produce work or exert change in the environment as long as it is at disequilibrium (thermally, mechanically, or chemically) with the surroundings. The concept of Exergy was developed out a need to understand how a limited amount of energy could be used optimally and transformed into the maximum amount of work. The basis for the concept is the first two laws of thermodynamics. The First Law of Thermodynamics is the application of the conservation of energy principle: energy can never be created or destroyed, although it can be transformed. Even if it is transformed the total energy balance is always conserved. When considering an isolated system, energy is never lost. An isolated system permits no exchange of matter or energy with the surroundings. An open system allows for exchanges of matter and energy with the surroundings. Therefore, in an open system, the change in energy in the system is the net sum of heat and work exchanged between the system and the surroundings. The Second Law of Thermodynamics states that entropy, a measure of disorder in a system, always increases in the universe (and in nature) and it is irreversible. The universe is transforming towards greater and greater disorder. The energy in the universe, although it will always be conserved, is therefore becoming less useful as we move through time. Entropy can be observed on a much smaller scale. For example, when gas is uncontained, it diffuses into the surroundings without the reverse process ever spontaneously occurring. Entropy, in most engineering examples, involves the unintended and irreversible loss of energy in the form of heat loss (Zisopoulos et al. 2015, 2016). All production chains, including biobased product supply chains, are not isolated and entropy is therefore occurring. Exergy analysis can be used to locate the losses or inefficiencies of a system. In other words, exergy analysis can determine where in a process or production chain, a product is being transformed in such a way that potential work is being lost. The food processing industry, for example, uses exergy analysis to pin-point inefficiencies in the use of energy and materials. The advantage of exergy analysis is that it provides a composite indicator, in joules, that allows both the use of energy in processes and the conversion of materials to be combined in a single indicator (Banasik et al. 2017; Zisopoulos et al. 2017). The concept itself is also interesting as a rule-of-thumb, by which the conversion of energy or materials will always result in a net loss of energy. Energy loss can be avoided by trying to maintain the chemical chains produced by biomass and not destroying them for heat energy. Biorefineries are central to the biobased economy as a whole, allowing for the efficient processing and use of various by-products generated from biomass. Cherubini (2010) defines biorefineries as the sustainable processing of biomass into a spectrum of marketable products and energy. With the use of a biorefinery, it is possible to extract valuable components from the biomass and transform them into a vast array of chemicals, materials, feed, fuel, and energy. ‘Biorefinery’ is an all-encompassing term for technologies that are able to make sustainable use of biomass. Therefore, biorefineries are considered the key component for the biobased economy. Extraction of valuable components from biomass takes place over multiple processing units within the biorefinery. The first step is often a pretreatment to ease the processing of the biomass in later steps. The next step in the biorefinery is the extraction of the valuable products from the biomass and then converting them into usable products. Conversion of the components can also be performed to increase the economic value of the end-product. The processing units within the biorefinery are performed through four main types of processes: biochemical, thermochemical, chemical, and mechanical process (de Jong and Jungmeier 2015). Every unit within the biorefinery needs resources such as energy, water, chemicals and produces by-products. These extra resources could have high impact on the economic feasibility and environmental sustainability of the biorefinery. A careful selection of the process step is vital, since costs can easily rise with the use of expensive chemicals. Additionally, a process step alters the characteristics of the feedstock which can influence the operating conditions of the following steps in the biorefinery. The integration of processing steps can reduce the energy and chemicals needed for the processing of biomass. Three different types of biorefineries are described in Kamm and Kamm (2004), phase I, II, and III biorefineries. Phase I biorefineries only accept one type of feedstock and are only able to produce one type of product. There is no flexibility in the process. A common example of a phase I biorefinery is dry-milling ethanol plants. Grain or corn is used as feedstock and the output is ethanol, feed co-products, and carbon dioxide (Kamm and Kamm 2004). The quantity of products produced is fixed to the amount of feedstock given to the biorefinery. Phase II biorefineries are able to produce a spectrum of products, in different quantities depending on demand, from one type of feedstock. By controlling the operating conditions of the biorefinery, the quantity of produced products can be shifted. Wet-milling is a common example of a technology used in phase II biorefineries. It can process either grain or corn and is able to produce starch, high fructose corn syrup, ethanol, corn oil or feed dependent on the demand (Kamm and Kamm 2004). Biorefineries that can handle different types of feedstock and produce multiple products are called phase III biorefineries. Phase III biorefineries are difficult to achieve due to the complex variety of biomass. Generally speaking, the more homogenous the input, the easier it is to process. Therefore, current reseach into phase III biorefineries is focused on different types of biomass that shows similarity in their composition. The lignocellulosic biorefinery is a phase III biorefinery that is widely researched and developed (Michels and Wagemann 2010). Its input is fibers from plant material that consists mostly of cellulose, hemicellulose, and lignin. Through processing steps, these components can be converted into more valuable chemicals such as glucose and furfural (Fernando et al. 2006). The current strategic goal of biorefinery is mostly focussed on the production of biofuel from biomass; however, biofuel is a low value product (Bozell and Petersen 2010). When looking into the value-pyramid, it is clear that chemicals have higher economic impact, thus could increase the financial incentives to stimulate the development of biorefineries. Determining which chemicals to manufacture is complicated by the plethora of possible conversion technologies and chemicals (Bozell and Petersen 2010). In 2004, NREL and PNNL published a list of 12 potentially lucrative chemical building blocks that can be produced from biomass (Werpy et al. 2004). The 12 chemical building blocks can subsequently be further converted into high-valued chemicals or materials. In 2010, this top 12 list was revised, with new high potential chemicals being addedd and chemicals with less economic potential being removed (Bozell and Petersen 2010). The revised list includes 10 chemical building blocks as opposed to the original 12. Material loops and the reuse of organic waste can occur across a supply chain or between different actors at different locations. Conventional supply chains can also be referred to as open-loop supply chains and involve the flows of material and eventual products form the producer to the customer. Managing an open-loop supply chain requires coordinating the various actors across the supply chain including material suppliers, manufacturers, transporters, warehouses, retailers, and eventually customer interaction. Open-loop supply chains do not, however, involve the end-of-life (EOL) management of a product. If the supply chain also includes the collection of the used products and packaging, then it is referred to as a closed-loop supply chain. The process of managing the EOL of a product including the collection of the used product for reuse, recycling, or disposal is referred to as reverse logistics (Khor and Udin 2012; Govindan et al. 2015; Govindan and Soleimani 2017). Biobased supply chains in which residual biomass, materials, and eventual organic waste are utilized can be described as closed-loop supply chains. The so-called first generation of biofuels were generated from the most valuable parts of plant that are rich in sugars and oils and best suited for food. Second-generation biofuels, however, are derived from crop residues, such as corn stover and the fibrous and woody part of plants that are not suitable for human consumption. Third-generation biofuels are derived from microalgae which are potentially more efficient at converting solar radiation to chemical energy than crop biomass. Food waste is also generated throughout the food supply chain. Part of the solution is to more accurately match the supply of food with the demand for food. In Europe, 21% of food produced goes to waste along the supply chain – 9% between agriculture and postharvest handling, 4% during storage, 5% during processing and packaging, and 3% during distribution (MacArthur et al. 2015). Once the consumer has purchased the product, they dispose of another 11% as waste instead (MacArthur et al. 2015). In total, approximately 33% of consumable food is wasted (MacArthur et al. 2015). In the Netherlands, the waste streams are often given to animals, fermented or incinerated. Forty percentage of food losses in the Netherlands are incinerated (Rood et al. 2017). Fermentation or incineration allows some of the energy to be recuperated. However, organic waste could rather be used in higher value products in order to utilize the proteins, minerals, and fibers that would otherwise be destroyed (Rood et al. 2017). Food, unlike technical material products, are restricted in their reuse due to food safety considerations, and therefore, there are only very limited possibilities for high-value reuse. A general rule-of-thumb would be to use food in its existing form by sending it to a food bank, for example, before converting it into an alternative product for human consumption. After that, it can be used as animal feed, feedstock for bioenergy, or compost. In this case, a closed-loop supply chain ensures the product’s complexity or exergy is preserved for as long as possible. At a nation state level, countries without vast fossil fuel resources, can switch to energy portfolios with a greater share of renewables which would include the production and use of biofuels. The switch to a biobased economy can ensure greater resource security by reducing dependency on fossil fuel exporting nations. Bioenergy could also potentially be used to balance peak demand in electricity networks when there is not enough wind to drive wind turbines (Jiang et al. 2017). Bioenergy can serve as readily available energy storage that can be utilized when other forms of renewable energy cannot meet demand. Other industries beyond the energy sector, such as pharmaceuticals, would also have greater protection from increases in global oil prices if their feedstock could be largely biobased. However, the question remains as to how vulnerable supply-chains dependent on biomass commodities are to changes in demand for food crops and unpredictable weather events. The switch to a biobased economy, which no longer extracts chemical energy in the form of fossil fuels from the subsurface, will require land for biomass production. The key challenge is to first maximize the output of value streams by intelligently producing biomass and intelligently configuring biorefineries and the overall supply chains. A potential limiting factor is, however, available land resources for biomass production. An increase in demand for biomass also carries the risk of land-use change and natural habitat or natural capital destruction. Emerging technologies such as third-generation biofuels or the use of cyanobacteria to convert sunlight and CO2 into useful chemicals might provide the solution to using less surface area and not requiring fertile soil. At a global level, the biobased economy has been described as providing clear advantages in terms achieving the United Nations Sustainable Development Goals (El-Chichakli et al. 2016). Progress towards eleven of the seventeen goals can be achieved by reducing dependence on fossil fuels, reducing carbon emissions and enhancing natural resource security (El-Chichakli et al. 2016; Bennich and Belyazid 2017). The biobased economy is cross-sectoral, spanning from agricultural production through to energy, chemicals and finished products (Staffas et al. 2013). Investments in the biobased economy, by the European Union, for example, create the potential for new markets and greater employment throughout the union’s economy (Fritsche and Iriarte 2014).